Olentangy’s Jace Middleton tries to shake free from Springfield’s Montryce King (41) during the first half of Friday’s non-league showdown in Lewis Center. Whatever was wrong with Olentangy’s offense over the first two weeks of the season wasn’t apparent Friday night. Olentangy surpassed its previous two-week point total by the end of the first quarter and rolled to a 53-33 win over Holland Springfield in non-league play in Lewis Center. Riedel ran for a touchdown and returned a punt for a score and running backs Zach Shiblaq and Trevor Solis ran for two touchdowns apiece to pace Olentangy (1-2). Shiblaq broke a 56-yard run in the first quarter. But, it was Riedel’s 23-yarder on the first play after a Landon Johnson interception that really turned things in Olentangy’s favor. Riedel followed it up with a 64-yard punt return as Olentangy (1-2) built a 29-7 lead at the end of one. Springfield quarterback AJ Gucciardo threw four touchdown passes, including two to receiver Devin Johnson. He also found Nate Stuckey on a 7-yard score before Josiah Pressley found the end zone with a 1-yard run to cut the Blue Devil deficit to 29-19 with a little over seven minutes left in the half. Every time Springfield made a move, though, Olentangy responded. 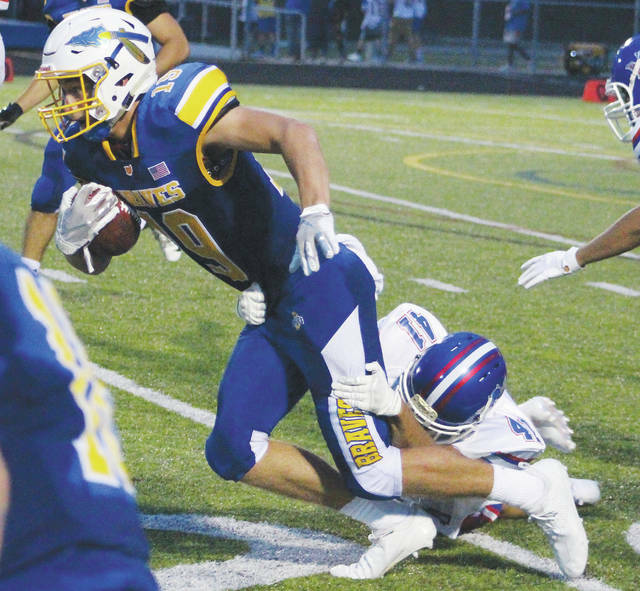 Caden Kaiser caught a short slant and ran 72 yards for a touchdown, avoiding the last defender with a stop-and-start cut-back at the 15 before scoring to give Olentangy a 17-point lead. Brady Pethtel added a 38-yard field goal with 25 seconds left to account for Olentangy’s 39-19 halftime lead. The teams played even in the second half. It took Springfield (2-1) two plays to find the end zone in the third. Pressley broke off a 48-yard run to set up a Gucciardo touchdown pass to Johnson from 32 yards out and the Devils seemed on their way. But, Olentangy just wouldn’t concede ground. Jace Middleton returned the ensuing kick 52 yards and Shiblaq broke free on a 38-yard run to set up Solis’ second score – a 2-yard run. Shiblaq scored his second touchdown on Olentangy’s next drive to push the lead to 53-26 with 5:45 left in the third. Guccardi hooked up with Brady Fisher on a 5-yard touchdown pass with 49 seconds left in the third to account for the final scoring. Next up, Olentangy continues non-league action at Dublin Coffman Friday night at 7 p.m.